Very happy to have a composition of mine (performed by trumpeter Orbert Davis’s group, featuring yours truly on piano) in director Bette Gordon‘s latest film The Drowning premiering Wednesday, May 10 at the IFC Center in NYC! Ryan Cohan Quartet at Jazz Showcase FEB 23 – 26! 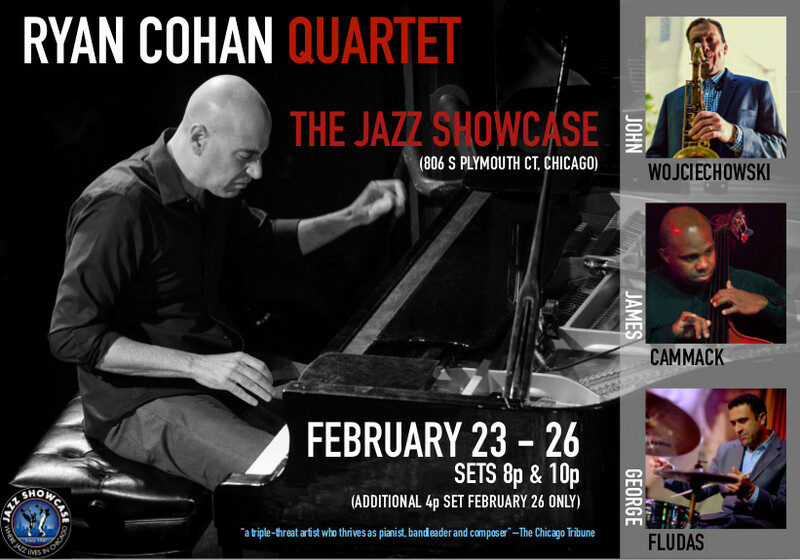 This Thursday thru Sunday (Feb 23-26), I will be performing at the historic Jazz Showcase in Chicago with my quartet featuring John Wojciechowski on woodwinds, James Cammack on bass and George Fludas on drums. I am really psyched to play four consecutive nights with these brilliant musicians and very happy to have James – a 30-year veteran of the Ahmad Jamal Trio and collaborator of mine from early in my career – returning to the group for these dates. I hope you can join us! 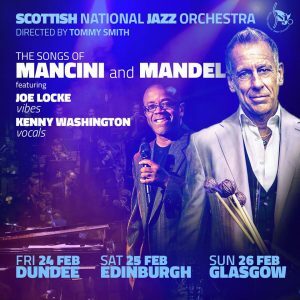 I am thrilled and honored to have been commissioned by the Scottish National Jazz Orchestra to provide an arrangement for their ‘The Songs of Mancini and Mandel’ concerts in Scotland February 24-26 (Dundee, Edinburgh and Glasgow) featuring Joe Locke on vibes and Kenny Washington on vocals! Founded by master saxophonist and composer Tommy Smith in 1995, the SNJO is a fantastic, forward thinking ensemble considered by many to be Europe’s foremost contemporary big band. 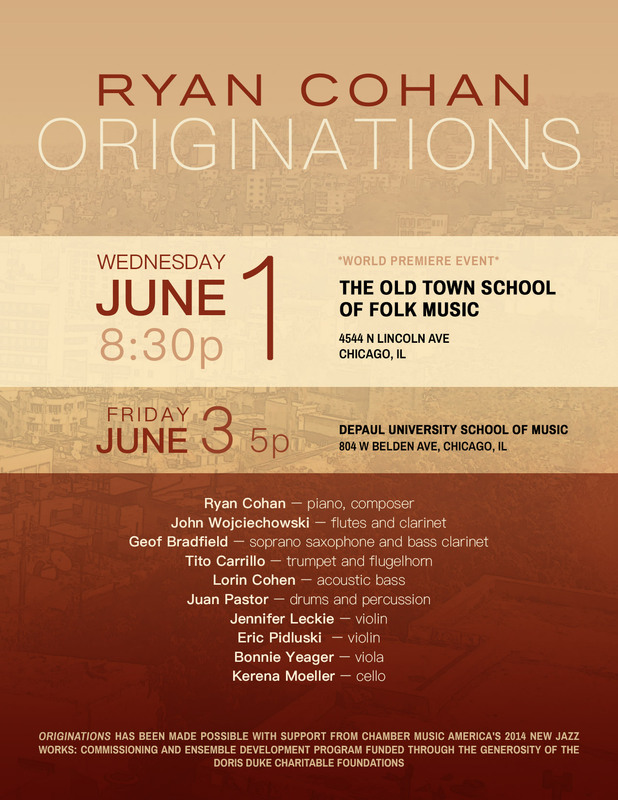 I am very excited to be debuting a new suite of music entitled Originations Wednesday June 1st at the Old Town School of Folk Music with a 10-piece jazz chamber ensemble formed by my sextet plus The Grant Street String Quartet! Comprised of four connected yet distinct pieces, Originations features a synthesis of Middle Eastern and other World Music influences, Classical compositional elements and jazz improvisation; all of which, in essence, reflect my own musical and cultural origins. The group includes the stellar talents of John Wojciechowski, Geof Bradfield, Tito Carrillo, Lorin Cohen, Juan Pastor, Jennifer Leckie, Eric Pidluski, Bonnie Yeager and Kerena Moeller. 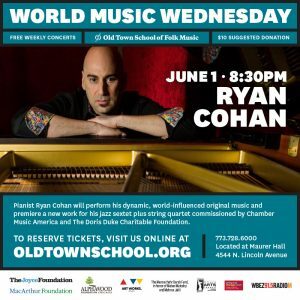 In addition to the June 1 world premiere event, we will also be performing the new work on Friday June 3 at The DePaul Univeristy School of Music at 5p. Originations has been made possible with support from Chamber Music America’s 2014 New Jazz Works: Commissioning and Ensemble Development Program funded through the generosity of the Doris Duke Charitable Foundation. 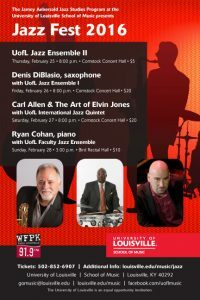 I am thrilled to be working with the University of Louisville’s esteemed Jamey Aebersold Jazz Studies Program as their Artist-in-Residence for the entire winter/spring semester. 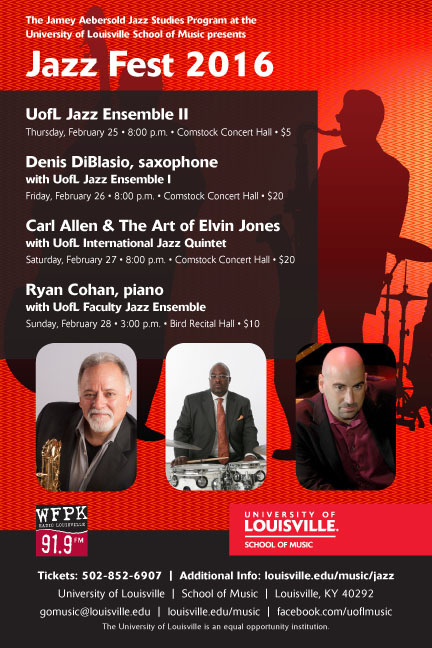 In addition to teaching their piano students, I will be coaching their ensembles and performing with the Jazz Faculty at the 2016 U of L Jazz Festival.